The old Korean proverb “A shrimp caught between two whales” sums up veteran correspondent Donald Kirk’s encounters in his book Okinawa and Jeju: Bases of Discontent. In this brief book in the Palgrave Pivot series, Kirk meets opponents and proponents of the American military bases in Okinawa, Japan, and the South Korean naval base in Jeju, South Korea. This is a timely review as on Oct 27 a US warship patrolled disputed waters in the South China Sea. The Chinese ambassador to the US responded by calling it "a very serious provocation” and warned against the militarization of the region. ▲ Donald Kirk sits on the Jeju coast. As Kirk outlines in his book, that ship has probably already sailed with China expanding down its nine-dash line and Obama pivoting to Asia. 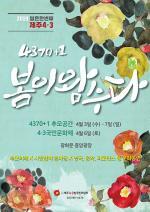 Jejuans and Okinawans are thus cast in the role of Davids fighting Goliaths, pushed around by the whales of Seoul, Tokyo, Washington, and Beijing. Rather than making their islands safer, they fear they are being placed in the crosshairs of war. “They are fighting with each other to gain power. This place is in the middle, and if they are in physical conflict, Jeju will not be defended but will be the victim,” one Jeju local tells Kirk. China’s designs on the disputed territories of Senkaku, Japan, and Ieodo, Korea, cast shadows over both communities. In Okinawa they say, “If we get rid of the base, China will come,” and the same fears fuel support for a base on Jeju. 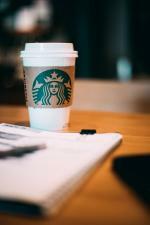 The book, however, mostly eschews arguments for or against the bases and instead focuses on exchanges with local (and not-so-local) activists, shopkeepers and mandarin farmers. Although Kirk concedes early on that straight comparisons between the two island regions would be “inherently flawed,” the former Vietnam War correspondent identifies some common strands. The ghosts of 1940s massacres haunt both — the American invasion of 1945 in Okinawa and the April 3rd Massacre of 1947-54 in Jeju — and islanders fear that outsiders will again bring death to their islands. Such divisions are apparent throughout the book, with some villagers pragmatically capitalizing on the changes that are idealistically opposed by others. Although staying mostly neutral, Kirk sometimes lets his guard slip. After seeing one “roly-poly” American jump on a concrete truck, Kirk asks him if he is in Gangjeong “just having fun.” Not giving his real name, “Mr. Booyah” denies the accusation. While protesters in Gangjeong seek to block construction in the most literal fashion, Okinawans wrestle with the relocation of the American Futenma Air Base to Henoko, while also protesting aircraft noise or “unsafe” Osprey aircraft. Kirk crucially highlights the inner conflicts not only within communities, but also the dissonance that individuals grapple with in facing realities and ideals. An exchange with an Okinawan store owner, for example, shows her longing for the trade that more GIs would bring, yet also worrying about the pollution that a new base would create. Despite these personal interactions, we only scratch the surface of their personal lives or the anatomy of the anti-base movement. The Palgrave Pivot series is intended for such depth, however, and a deeper look at anti-base and social movements in Japan and Korea would be a welcome follow-up work. The book is also heavily weighted toward Okinawa, and by the time we get to Jeju on page 97, there is only enough room for a brief overview of key issues. Nevertheless, the book successfully highlights the importance of these beautiful tourist islands to very different people. Protesters romanticize their pristine and peaceful nature, whereas hegemonic military forces eulogize their supposed strategic importance. It is the little people in the middle who Kirk shows to be mostly pragmatic, weighing up the pros and cons of a fight that is largely out of their hands. I was reminded of the work of author Thurston Clarke, who describes how islands are rarely the bedfellows of sober reason. “The longer I waited to discover why islands are so intoxicating, the greater the chance that their undefined and mysterious charms might vanish,” writes Clarke in Islomania. Both the Davids and the Goliaths of Okinawa and Jeju are intoxicated by this charm, and the fear is that one day the great powers of the region will imbibe a little too deeply. When that happens, it is hard not to feel that the Okinawan shopkeepers and Jeju mandarin farmers will once again be shrimps caught between two whales. 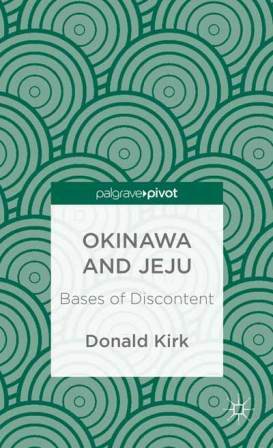 Okinawa and Jeju: Bases of Discontent (2013) by Donald Kirk is published by Palgrave Pivot and is available in Kindle and hardcover editions.